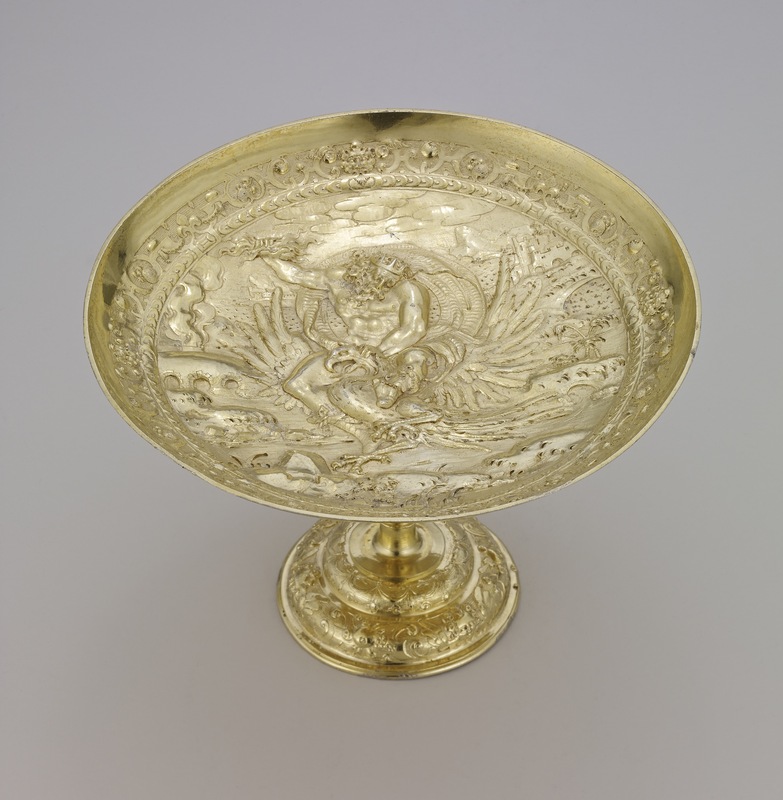 Tazza, silver-gilt. Embossed and chased, one of a set of twelve. Relief depicts Jupiter as male figure emblematic of Fire (Ignis), riding on eagle through sky, above a rocky landscape with smoke rising from a chimney. His torso is naked with his robe billowing behind him. His right arm is raised and he holds a thunderbolt in his clenched fist. Narrow classical inner border, wider outer border with four lion masks at cardinal points, linked by strapworked drapery and fleur-de-lis motifs. Circular domed foot decorated in two stages, lower section with winged cherub heads, scrollwork and fruit, upper with drapery and pendant folds, tassels and scrolls. Stem in baluster form, chased with strapwork lions-masks, fruit and drapery, with short upper section with profiled ring and four scroll-brackets curving up to bowl. Underneath foot is a small disc engraved with an angel holding drapery in which an oval shield in a cartouche bears the arms of the Counts of Thun, Tirol and Bohemia. 'Origin: Mark of Paul Hübner; Augsburg, c. 1595. Commentary on this tazza: For the first time in this set, Paul Hübner has used a male figure. Significantly, Hübner also used the same ‘Jupiter and eagle’ figure group in his small set of twelve tazze purchased by the Archbishop of Salzburg in 1594 from the merchant Bartholomäus Fesenmayer (see K. Rossacher, ‘Der Schatz des Erzstiftes Salzburg’, Salzburg, 1966, p. 143 with illus. ; also Seling 1980, p. 254, fig. 201). Dr Weber has pointed out its close relationship to the woodcut by Jost Amman, reproduced in the ‘Kunstbüchlein’ of 1599 (Weber 1970, p. 343). The only significant departure from the 1594 tazza is the downward twist of Jupiter's head on the Waddesdon Bequest tazza. Although the landscapes are not the same, the same huge furnace with its smoking chimney is repeated on the left side of both landscapes. The bold attempt by Paul Hübner to create the impression of an aerial view is perhaps more successful on the Waddesdon Bequest tazza but, again, it is a daring, new idea which has few rivals at this date, c. 1595-1600.